What if someone had discovered the knives used by Jack the Ripper? What if they went missing? What if he came back into our world? Damian: Razors is a British independent film and the first in a new horror franchise. The story concerns the discovery of the knives used by Jack the Ripper. Are you using the iconography associated with the Whitechapel murders of 1888 for cinematic and dramatic effect or is there also particular reference made to any of the suspects and their history? Ian: We don’t really make reference to the suspects in the first film, but certainly the inclusion of the Ripper is not there purely for cinematic effect. The location where the story is set is pretty unique and has a resonance and relevance to the Ripper story. It isn’t in fact the Asylum where we originally intended to shoot, but a building in Islington that dates from the 1880’s, and was originally a veterinary hospital for horses. It is now used as a club, but its Victorian origins are all too obvious when you venture into the depths of the building, something we have enhanced by lighting the old brick stairways with flaming candles. As the central story is about a group of very genre aware screenwriters, using the location to inspire the writing of a ground breaking horror story, one of the leaping off points for the film is a questioning of the morality of writing a horror film, and especially one written around real events. The Ripper killed five real women in terrible ways and without wishing to give the game away it is the victims who take on a special significance in the film. The screenwriters are haunted by the ghost of a little girl from the Ripper’s time, she is trying to bring their attention to a terrible event from the past and part of the mystery for the audience is working out her identity. Karl: For Razors the focus is more on the horror and fear of what the Ripper did to his victims. The story is orientated around the exploration of fear and the unearthing of a fictional history based on the facts in regards to the victims. So our attention is on the victim and not the Ripper himself. For the next films we are going to delve deeper into that world of Jack. We just didn’t want to tackle too much in one go. Damian: What can you tell us about your Jack the Ripper mythos and how you have managed to transport the Victorian characters and events into a contemporary setting for the film? Ian: In Razors a troubled young screenwriter, Ruth Walker, is one of six screenwriters taken to a unique Victorian location, a place with a history, by their enigmatic tutor Prof. Richard Wise. All must pitch the ultimate horror movie and Wise will chose one story that they will then develop together using the building for inspiration. But Ruth has the ultimate pitch in that she believes a box that she has inherited contains the knives used by Jack the Ripper, and she has been told never to open it. (Quite how she has obtained the box is explained later in the film). No one of course believes her but after the pitches, and as the competition between them hots up, the knives go missing and it seems that the spirit of the Ripper exists behind the walls of the building and is being slowly reborn. The screenwriters have been drawn to writing horror by nightmares they have had since childhood and a shared sense of doom. 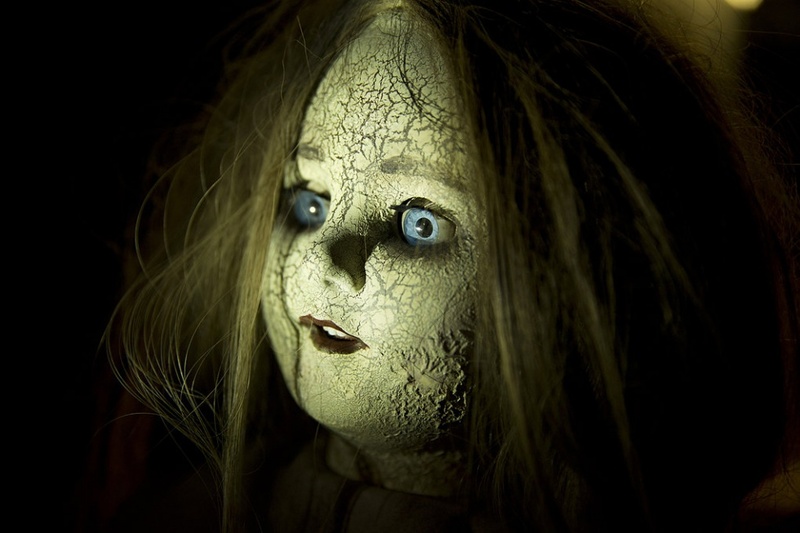 At the risk of giving away too much of the plot, (some plot spoilers ahead) the screenwriters are haunted by the ghost of a little Victorian girl who seems to be drawing them towards a long hidden secret, and the film hints at a possible sixth, undiscovered Ripper murder that happened in a chamber hidden behind the walls. The Police interrupted it and although the Ripper escaped, managed to take his knives but not before the little girl hid one of them within the walls and trapping the spirit of the Ripper there. Thus to stop the Ripper once and for all, and to prevent his escape into the wider world, Ruth must find the missing knife and use it to destroy him. In doing so the screenwriters will discover the identity of the little girl and their own particular relevance to the Ripper’s story, which is the film’s big final twist. Thus in Razors we set up a concept that can be developed further in later films. The knives are a kind of seal on the Ripper’s tomb and wherever they are now taken, the avenging spirit of the Ripper will follow. Karl: Our Jack the Ripper could be anyone. He could be your brother or best friend. As we all know there are many theories about who Jack was but for us the importance was what he stood for. He is a symbol of fear that everyone all over the world can identify with. We do drag other characters contemporary to Jack’s time into the film (we get a cheeky glimpse of Abberline amongst others), but the idea is to mirror the events of that time and not to reproduce it. Fear of the unknown is the ultimate duality between the mythos of that time and of our society now. Imagine Jack as an ideology for terror… A terror threat. Something everyone fears yet cannot avoid. A hellish image of pain and suffering. Damian: We obviously don’t want to reveal too much but can we talk about Andrew Shire who plays Jack the Ripper and how you approached the writing and directing of such an enigmatic character? Ian: I think we very consciously went for a different look for the Ripper and wanted to avoid the top hat and opera cloak approach. I took the Ripper tour and was struck by the idea that he could have been a workman from a slaughterhouse, who could have got blood on his clothes and entered a public house in the early hours of the morning without arousing undue attention. Karl has come up with a really cool story idea for the identity of the Ripper which we will explore in one of the sequels; it is a plausible and intriguing concept but not one that pretends to be based on historical fact or the existing list of suspects. As to Andrew, he is an extremely powerful actor who I had used in my previous film, Seeing Heaven. He looks very enigmatic and really gives it his all. He is a sinister presence in this film, and subsequent films will need to build more on his character, but he brings a pretty deranged approach to playing the Ripper which is a nice contrast to the usual black eyed enigmatic figure of evil in From Hell. Karl: Andrew and myself worked a lot on making sure the approach to such an iconic character was fresh. We wanted the character to be familiar but certainly not the typical Jack the Ripper you see in comics or drawings scattered all over the place. I tried to keep Andrew as distanced from the other actors on set as possible; I wanted to alienate him as an actor from the others. As a character he doesn’t say much in the film so it was important to work on physicality and to keep Andrew focused on his motivation which I will not reveal. As you say, that would give too much away. The dialogue between Andrew and I on set was rather unsettling. We got a few funny looks from the rest of the cast and crew as they heard little glimpses of what I whispered to him. Thankfully Andrew was excited by this approach and went along with it. The result I feel is very animalistic and daring. Damian: Were you tempted to watch the classic screen representations of Jack the Ripper such as Murder by Decree or the Michael Caine miniseries for example? 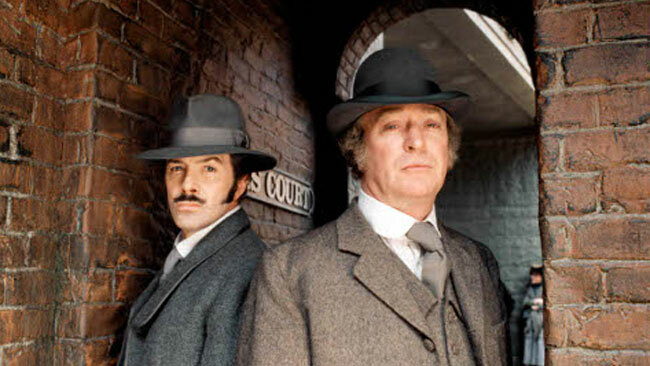 Ian: I have seen both, the Michael Caine series when it originally aired and Murder by Decree when it was shown back in the late 70’s or early 80’s on TV. So Murder by Decree is a strong memory from my youth. I think it is a superb film. I think I also dimly remember the Z cars detectives take on the Ripper case programme that started off the Royal theory thread. I would have liked to have referred more to particular elements of the Ripper murders and to have woven them more into our present day story. These elements were present in the original shooting script (e.g. the writing chalked on the wall that is wiped off by the chief of Police) but this evolved a little in shooting and now this first Razor’s film concentrates more fully around the story of the central character Ruth who has the knives and her five fellow script writers. To be honest a whole host of influences have gone into the film, including the idea of the little girl from Hands of the Ripper although in this film she is not the Ripper’s daughter, and we have used her character to design a new twist. There is also a nod with her to Mario Bava’s Kill Baby Kill and the idea of little Ghost girl’s in Peter Straub’s work…especially the Mia Farrow film Full Circle. There are also references to The Stone Tape with the building keeping an essence of past events. Karl: I had seen clips when I was younger… I love Michael Caine. Anyway, for me the film is more of a psychological struggle of upbringing and fear so I researched a lot into real serial killers such as Ed Gein, Charles Manson and others. It’s always fun to see interpretations of a character through other films yet to create something a little fresher I felt that finding real case studies was more useful. I tend to get more influenced by music, sound and objects than anything else. For me that’s always a good starting point. To name a couple of tracks Justice Stress and the Nick Cave and Warren Ellis score for The Road. Damian: Again, avoiding spoilers, can you tell me more about Professor Richard Wise? 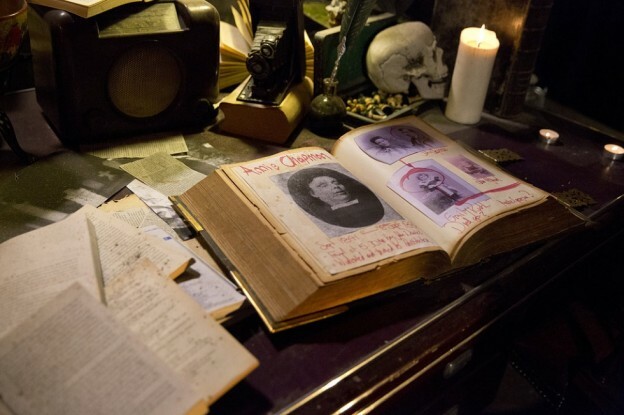 Ian: Professor Wise is a professor of screenwriting who takes five of his most gifted students to the old Victorian location at the centre of the film, for a kind of horror boot camp, to encourage them to explore their fears and write the ultimate horror story. But of course he may also have an ulterior motive. Wise believes in “bad places” that have existed throughout history and can exert an influence on the present. Probably the biggest influence on Razors is the original Robert Wise film of The Haunting. Thus Professor Wise is a bit of a homage to the Richard Johnson character in that film. He is very much in the tradition of learned authority figures who takes a group of characters to a historically significant place with somewhat murky motives. He is a scholar and as the film progresses we might begin to wonder quite what it is he knows about the Ripper murders and the way that the five screenwriters, despite being modern characters, might fit in to them. The big twist of the film is that they are more intimately involved than you might think. Thomas Thoroe plays Wise with a nice enigmatic and icy edge. He is affable but also a little bit scary. Karl: A sick, macabre, Faustian mess. Damian: The aforementioned plot element featuring the idea of a group of writers competing to write the ultimate horror story reminds me of that dark and stormy night in 1816 when a group of friends including Shelley, Byron and Polidori challenged each other to a similar endeavour which resulted in the creation of Frankenstein. I was wondering if this was a deliberate homage? Ian: That was a wonderful story, but I suppose here we have taken a bit more of a Scream approach as the characters are young screenwriters. The stories that the screenwriters pitch to each other, tell us a lot about their characters. 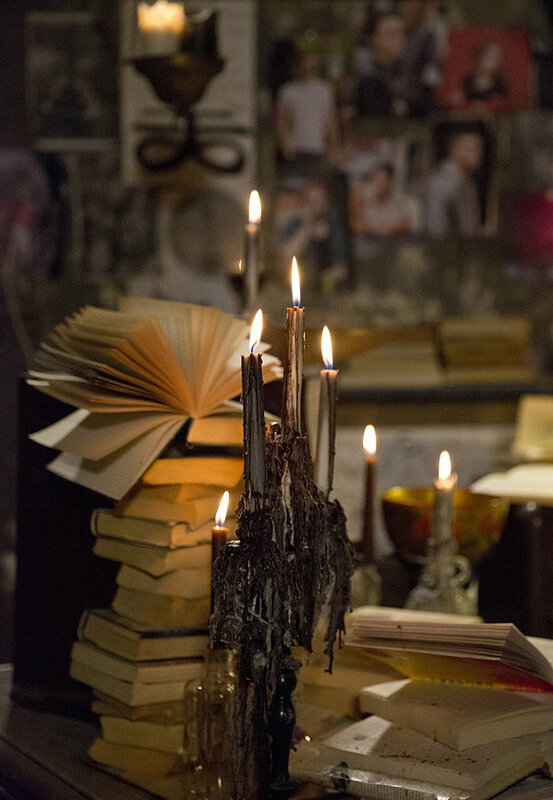 So Zack the American pitches a Hostel type bloodbath, James the English geeky guy, something more intellectual, Sadie and Jane, an Elizabeth Bathory type vampire story that they have worked on together. I guess the similarity with the gothic story is that Ruth (like Mary Shelley) has a complicated Freudian back story that influences what she writes, a history of violence at the hands of her own father etc. Karl: I wish I could say it was. Regardless, I love the comparison. Shelley’s gothic novel is a massive influence on me as a writer. Thank you. Damian: Your production company, Magic Mask Pictures, specialises in visually striking and high concept fantasy/horror films, given that Razors has the aforementioned present-day setting, to what extend does the meticulously crafted lighting shot by the award-winning cinematographer, Alessio Valori, attempt to evoke Jack the Ripper’s Victorian East End of London? Ian: In Seeing Heaven my last film, Alessio went for a very intense use of primary colours as a homage to the great Italian fantasy director Mario Bava. In this film the use of colour is more restrained but Alessio wanted to stick to a discipline of largely lighting the scenes with candles and the characters’ torches, augmented with relatively few film lights and neons. The textures of the walls and other elements of the junk filled building give it a special ambience and we didn’t have to do much to create an oppressive atmosphere. Ironically, the actual location we used is full of secret rooms filled with collections of objects and in fact, it also houses a scrap metal yard which the police have used to destroy knives and other weapons, thus the plotline around the knives has a small echo in the building’s real history. I would also mention that we were very lucky to have David Blight designing our costumes and he has worked on a large number of TV costume productions. So in the few instances when we skip back to Victorian times, the costumes look authentic. Karl: We used a lot of natural light from candles in the film. This meant we could move around the locations quickly and get more shooting material logistically, but it also mirrored the lighting states that would have been seen at the time. Alessio is an incredibly passionate cinematographer and the proof of his expertise is in the shots themselves. For the time we shot it in and the budget, Alessio has really produced imagery that surpasses what was expected. When Ian and I started to look through what we had captured we couldn’t wait to hit the editing suite. Damian: You’re a great admirer of the directors Dario Argento and George A. Romero, do you think the work of these two icons of the horror genre have influenced your films or the visual style of Razors? Ian: I love the politics and social themes of Romero’s movies and I am a big fan of the ingenuity of Argento’s early movies. However I am a bigger fan of Mario Bava, with his ability to create a sense of pure dream states in his films and to use colour to signify passion and emotion. We are currently working in the edit in the dream montages, and if we can get the audience to lose themselves within them, we will have achieved something. I am also a big fan of practical effects and atmosphere rather than CGI and Alessio Valori our cinematographer is very skilled in this regard. So even before colour grading, the film has a distinctive look that is all achieved in the camera and through skilful lighting. Damian: You’ve recently completed principal photography and are currently in post-production, when can we expect Razors to be released? Karl: This year. It’s a lengthy process but we are working closely with editor Euan Donaldson to create a film that is exciting for an audience to watch. The film is shaping and moving in ways we never anticipated before. It’s scary and exciting, but ultimately cannot be rushed. There are moments when things slot into place and I feel genuinely anxious about what is going to happen in a scene I’ve seen numerous times. I hope that the auditorium will be inquisitive and a bundle of nerves. But to be honest, I am not sure if I could sit in there with them! 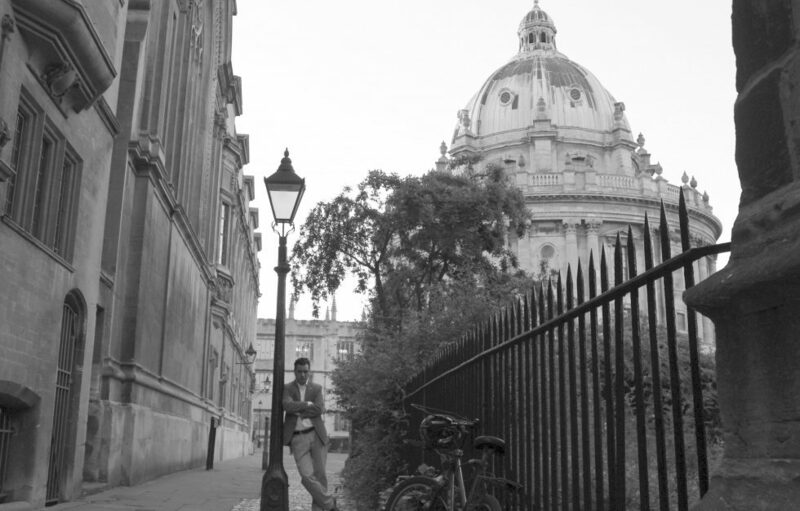 Ian: I would also just like to add that the film has another East End connection in that we worked closely with students from the SAE institute in Haggerston, who got their first feature film credit, working with us on the film. We are hopping when the film has finished that it will have an East End cinema premiere. Damian: As you’ve already mentioned, Razors is only the first chapter in an ongoing series of films. What is your overall vision for the franchise? Ian: We just want to create and intelligent and different horror franchise that goes beyond the usual teenagers in peril formula. The Ripper’s knives will get stolen in one of the sequels by an unscrupulous art dealer and will turn up in America, where of course it is thought by some that the Ripper actually escaped to after the five core murders, with additional murders happening there. We also plan a slightly post-modern detour in one of the sequels, with the writer of the original film, haunted by the ghosts of the Ripper victims, who implore him to find out the Ripper’s true identity, as they never actually saw his face. (As a Shoreditch resident when I walk around Brick Lane I am very conscious of the actual locations of the murders). Karl: We will delve deeper into the mythos and explore darker corners of its world. We have a few tricks up our sleeve both period and surrealist – you’ll just have to wait and see! Damian: Ian and Karl, thank you very much indeed. Thanks to Sue Foll for her photography. This entry was posted in Jack the Ripper and tagged Alessio Valori, Andrew Shire, David Blight, Euan Donaldson, Ian Powell, Jack the Ripper, Karl Ward, Magic Mask Pictures, Professor Richard Wise, Razors, Sue Foll on August 6, 2015 by Damian Michael Barcroft. TUESDAY, 18TH OCTOBER 1988 was one hell of a long day for me. I must have been only thirteen at the time but I can vividly recall sitting at school, maths in particular, and staring out of the window dreaming of the televisual treat ahead of me that evening. Having vigorously studied copies of both the Radio Times and the TV Times the previous week, (remember the days when you actually had to buy both publications for the BBC1 & 2, ITV and Channel 4 listings? ), always on the lookout for horror movies, particularly those from Universal Studios and Hammer, I noticed something called Jack the Ripper. Although I knew little about him, I had heard of him before and that name was as familiar to me as Dracula, Frankenstein, Dr. Jekyll & Mr. Hyde and all of those other classic monsters. What I didn’t know was that he had actually existed and after reading more about him, I was thrilled at the prospect of discovering his identity. Fractions, percentages, not even the pretty girl with whom I shared a desk – who, despite various fantasies to the contrary, I never did end up marrying – could distract me from the foggy and gas-lit streets of Whitechapel. Who was Jack the Ripper, why did he viciously murder all those women and why was he never brought to justice? So well crafted and exciting, the mini-series had such a profound effect on me that twenty three years later, and like many other Ripperologists, I am still asking myself those same questions. However, for many years and because of this production, I believed that the Ripper mystery had been solved and that the murderer was Sir William Gull. Only after reading several books, and watching other films and documentaries on the subject, did I realise that there were other arguably more credible suspects and that I had been somewhat naive or worse, even cheated into thinking that the case had been solved once and for all. Watching the film again for the purposes of this review, it still retains its power over me and the child within still wants to believe. For me, the production remains a classic of the genre and I consider it to be perhaps the best of all the Ripper dramatic productions made for either television or the cinema. There is just one problem, as an adult, I’m afraid I don’t believe a word of it and as great a television producer and writer that David Wickes obviously is, I suspect he has been pulling my leg all along. 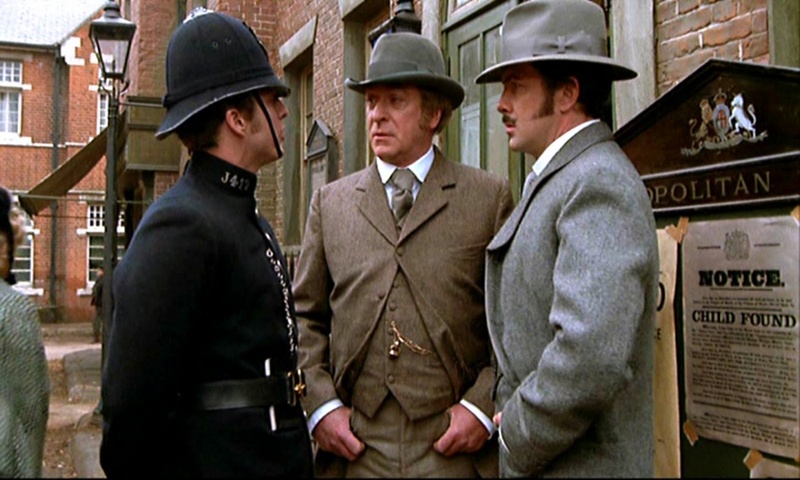 ‘What was surprising about Jack the Ripper was how little Wickes and his co-writer Derek Marlowe added to the ideas advanced in 1973 [Wickes was responsible for a BBC production made in that year], instead, they subtracted from them to smooth the path of melodrama, for melodramatic Jack the Ripper most certainly was. Gone were the shenanigans involving the Freemasons; gone was the royal connection (except for Eddy’s nomination as one of the many red-herring suspects); gone was so much as a whisper of a government cover-up. The prime suspect remained the same, and the mechanics of murder were plundered, uncredited, from the work of the now-dead Knight’. Also in the DVD commentary, Wickes does mention that he had been in contact with Stephen Knight way back on the BBC version but this is as far as the acknowledgement goes. During the same period, Wickes states that he got to know Joseph Gorman Sickert who believed that the Ripper murders were carried out by Sir William Gull in order to protect the scandalous secret of Prince Albert Victor’s illegal marriage. One detail that emerged from this particular experience was that there must have been a second person involved in the Ripper killings because of the distance between the double murders sites and the idea of a coach driver became prominent in Wickes’ mind although Sue Davies claims John Charles Netley as her own discovery. Regardless, the Sickert hypothesis was not only highly controversial, but has since been examined and rejected by most serious students of the Ripper killings. ‘The quarrel with Wickes’ approach to Jack the Ripper is not the degree or nature of dramatic license employed by the film-maker; every creative individual, from Sophocles through Shakespeare to Oliver Stone, has shunned historical accuracy when that accuracy fails to conform to dramatic effect. The quarrel is with the public presumption of a film’s historical credibility which is often manufactured by the artist through the means of the modern docudrama. Dramatic effect is no longer dramatic effect but historical accuracy, films that were once just films – presentations, not representations, of history – now masquerade as historical documents. Audiences are either willing to accept, or are unable or ill-prepared to challenge, the ideas that are conveyed as fact or truth through such films. As a result, history gives way to propaganda in a manner it never has before’. 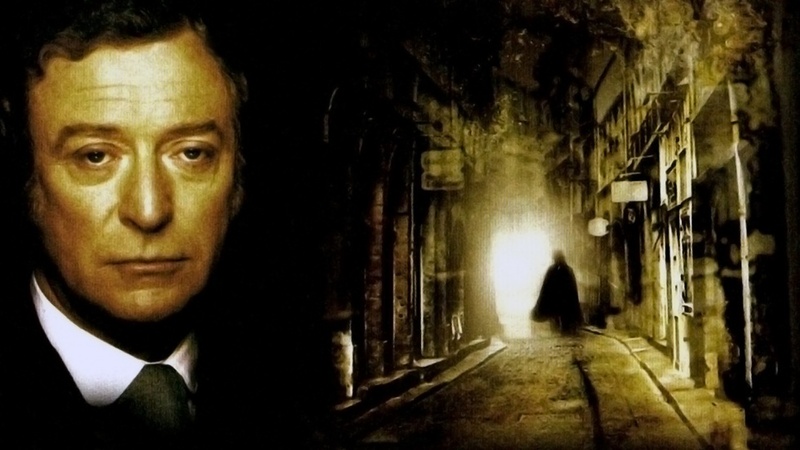 It is interesting to note acclaimed Ripper expert Donald Rumbelow’s reaction to the film commenting at a 1995 Arts and Entertainment Network biography of Jack the Ripper: ‘I’ve been astonished at the number of people, for instance, [who] look at the Michael Caine film and say “Oh, the mystery is solved”. It’s not. The whole thing, 99% of it, is fiction. But for a lot of people that’s the solution to the case; so, therefore, if they do come across evidence, if they do come across documentation they’re not going to put it forward because they think the mystery has been solved. It hasn’t and that’s one of the things we need to sort of get over. We are still looking for the identity of Jack the Ripper’. Another commentator, Christopher Hudson writing for the Daily Mail in May 1997 observed: ‘Some years ago I was invited to write the screenplay of a film about Jack the Ripper based on precisely such [aforementioned] “exclusive” Home Office files, which were said to confirm that Queen Victoria’s personal physician, Sir William Gull, was the Ripper. As I inspected the photostats of these files – and what a miserably small, uninformative collection they turned out to be – it became plain that Sir William was no more likely to be Jack the Ripper than was Queen Victoria herself’. However, as much as I admire and largely agree with the arguments put forth by both Denis Meikle in his book Jack the Ripper: The Murders and the Movies and Gary Coville and Patrick Lucanio in theirs, Jack the Ripper: His Life and Crimes in Popular Entertainment, I do not wish for them to eclipse the monumental achievement of David Wickes, Euston Films/Thames Television and the entire cast and crew. Even at the very beginning of the film, from its audience grabbing and authoritative sounding voice-over to the majestic music score by John Cameron and the evocative cinematography by Alan Hume, the production exudes class and distinction. Of course while the hypothesis that Mansfield the actor might have conceivably suffered from such a similar schizophrenic personality, leading to the Ripper’s murderous crime spree, is a dramatically (albeit melodramatically) entertaining notion, there is little evidence to suggest he was either a valid suspect or had even ever met any of the victims. However, the fact remains that Mansfield was indeed appearing at the Lyceum in the dual role of Dr Jekyll and Mr Hyde during the time of the Ripper murders and this red herring is perfectly in keeping with Robert Louis Stevenson’s short story in terms of its themes and issues. 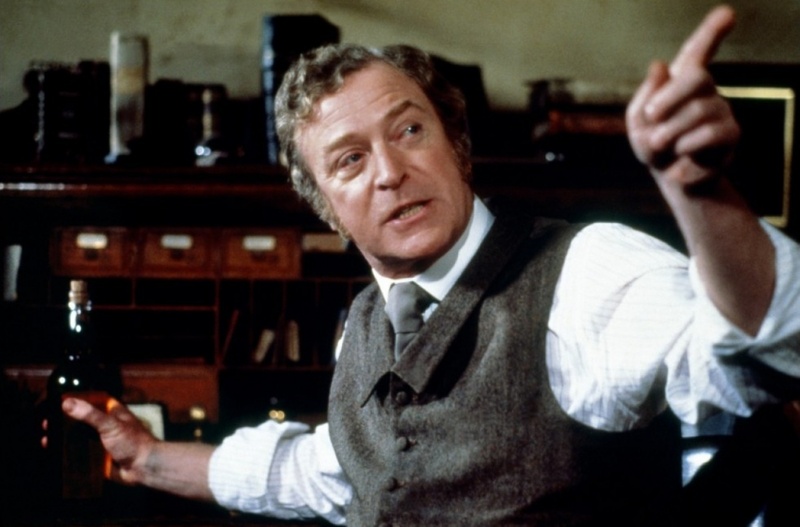 I was also greatly impressed with the evocative production design which obviously benefited from the multi-million-dollar signing of Michael Caine and the generous backing of the American network CBS, providing the audience with arguably the most credible and authentic sets of any Jack the Ripper production thus far. Over sixty sets were used, all of which are suitably atmospheric but carefully balanced so as to avoid the gothic cliché so often exploited in films of this genre. Actual location footage included a disused asylum in Virginia Water, Surrey, and Greenwich Naval College which interestingly was also used in the aforementioned Jack the Ripper vs. Sherlock Holmes film, Murder by Decree (1979). The cast and quality of their performances are mostly excellent. 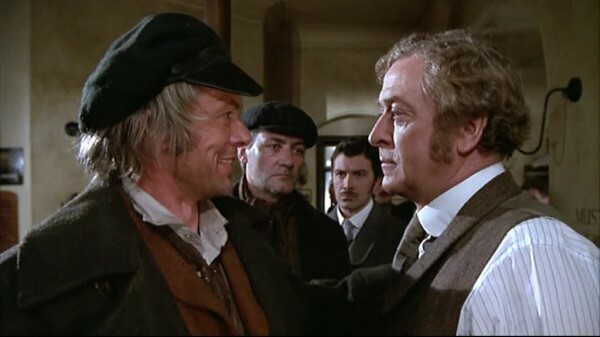 Michael Caine as Chief Inspector Frederick Abberline holds the film together with his gravitas and sheer star power, while Lewis Collins as Sergeant George Godley delivers a solid performance as his sidekick. They both display an obvious affection for each other and their on-screen chemistry frequently evokes that shared by Holmes and Watson with plenty of welcome humour that acts as a brief respite from the horrific elements. A particular highlight is Godley attempting to take notes while Abberline asks for Gull’s analysis of madness and schizophrenia. 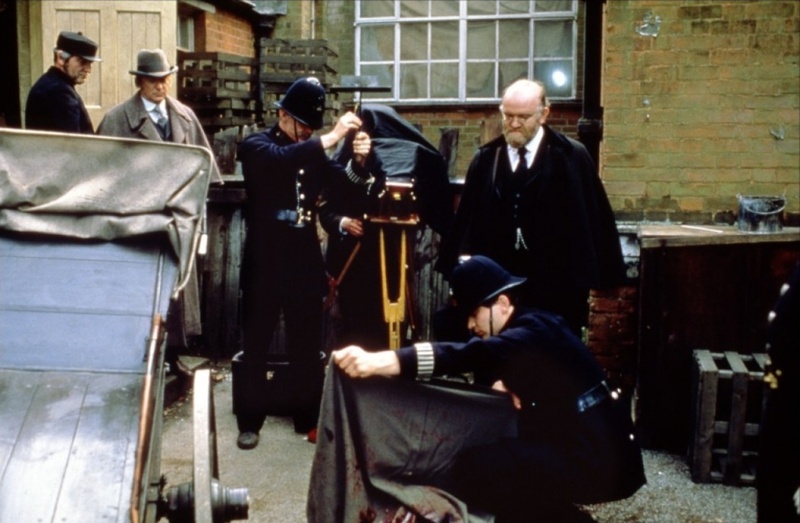 It was also refreshing to see the remaining canonical victims (the murder of Mary Nichols had already taken place before the start of the film) played with empathy and respect by Deirdre Costello (Annie Chapman), Angela Crow (Elizabeth Stride), Susan George (Catherine Eddowes) and Lysette Anthony (Mary Kelly) as oppose to the usual stereotypical Cockney tart characterizations that litter productions such as these. This is not to say that the production is without its problems, most notably the obligatory romance for the lead character which is both superfluous and conventional in the extreme. However, this is a small price to pay and at least Jane Seymour’s character (artist Emma Prentiss) is actually historically correct although there is no evidence to connect her to Abberline, particularly a romantic link. Other issues that grate slightly include Caine, and as powerful as his performance is, he is never far removed from the persona we are accustomed to: ‘Caine is at one with the others in the cast in bawling hysterically at every opportunity, epitomising all those comedic caricatures of himself as he does so and constantly recalling the moment in The Italian Job (1969) when he blurts out, “You were only meant to blow the bloody doors off!”‘ (Meikle). Indeed, only fourteen minutes into the film and at regular intervals afterwards – justifiably or otherwise – he is screaming and shouting in that seething and spitting manner of his. Additionally, in one of the few performances by the supporting actors that fails to entirely convince, Michael Gothard as the rioter George Lusk becomes a little too over the top and clichéd, shouting “Murderer! – Hang him! far too often whenever the opportunity presents itself. One could argue that these scenes, and indeed his performance in them, are meant to reflect the panic and hysteria of the time but equally, repetition of this nature does become a little tiresome after awhile. Undoubtedly one of the most entertaining aspects of the production is the whodunit element which successfully keeps us guessing until the grand finale in which Jack the Ripper/Gull is thrown out of the cab by Abberline. Indeed, towards the end of the climax virtually every male cast member is put under suspicion but the most impressive list of suspects include: the celebrated American actor, Richard Mansfield (Armand Assante), anarchist and President/chairman of the Whitechapel Vigilance Committee, George Lusk (Michael Gothard), alleged royal psychic Robert James Lees (Ken Bones), two doctors; royal physician Sir William Gull (Ray McAnally) and his son-in-law Theodore Dyke Acland (Richard Morant), the delusional freelance cabbie, John Charles Netley (George Sweeney), and to the horror of the police and government officials, Queen Victoria’s grandson, Prince Albert Victor Christian Edward – Duke of Clarence (Marc Culwick). 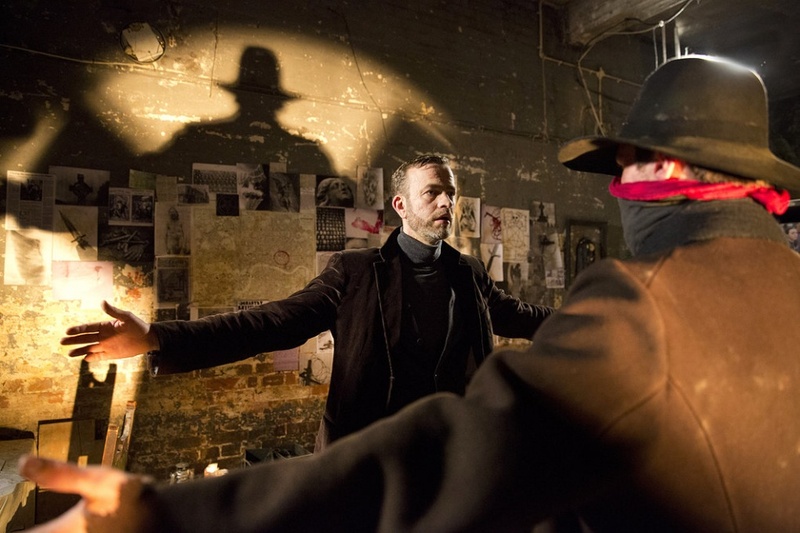 In conclusion, I suspect that this production was something of a political platform for Wickes’ own beliefs and opinions using the character of Abberline “I hate politicians” as a mouthpiece for his own interpretation of events and his almost blinkered assessment of the wealth of contrasting theories surrounding Jack the Ripper. Indeed, during the DVD commentary, there are numerous signs of a certain resentment or lack of respect towards enthusiasts of the subject or those with conflicting opinions as to the identity of the Ripper including calling us ‘Ripper freaks’, stating that ‘most Ripperologists don’t know a dam thing’ and labelling a significant amount of related literature as ‘sub-journalism [that] was not the sort of scholarship that we were into and Sue, who is educated and intelligent wouldn’t accept that kind of standard’and so most Ripper books were rejected as a load of rubbish! He goes on to eliminate the Duke of Clarence and James Maybrick as suspects, labels the Freemasons as ‘another romantic theory’ (although he accepts it could have been a Freemason but not the Freemasons), shows disdain for Patricia Cornwell calling her book and theory ‘laughable’. However, these issues aside, and despite what Coville and Lucanio call a ‘hodgepodge of conspiratorial theories and an overindulgence of dubious historical characterizations’, the production remains more than just a beautifully crafted film to commemorate the Ripper’s centenary, but also an enduring one which even manages to resonate and parallel recent events including the disgraceful London riots and newspaper scandals – the sensationalist and exploitative reporter for The Star, Benjamin Bates (Jonathan Moore). Regardless, and as interesting as some of the arguments put forward here might be, none of this really matters in terms of the intrigue and enormous entertainment to be found in Wickes’ film that manages to please both the curious child and adult within us all. This entry was posted in Jack the Ripper and tagged Jack the Ripper, Michael Caine on May 26, 2013 by Damian Michael Barcroft.